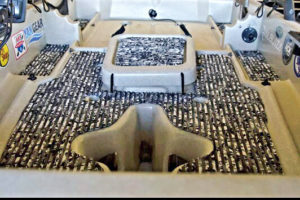 YakGear’s DeckMat is made from ultra-high quality EVA foam and uses an easy peel-and-stick application making them extremely versatile to apply almost anywhere on your watercraft—swim platforms, helm areas, complete cockpits, accent areas such as under gunwales, inside storage lockers, or as step pads entering the boat. Use them to customize your kayak, canoe, or boat exactly the way you want it. The matting’s installation is quick and easy and will adhere to most surfaces, smooth or non-skid fiberglass, aluminum or steel surfaces, painted or sealed wood, and even plastic. With YakGear’s DeckMat you are only limited by your creativity and imagination. 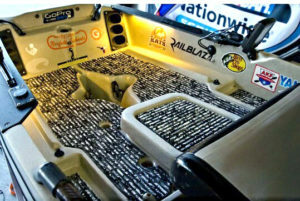 Installation is quick and easy with DeckMat products carried by YakGear. You can apply your DeckMat to most surfaces — smooth or non-skid fiberglass, aluminum or steel surfaces, painted or sealed wood and plastic. Learn more here or find a YakGear retailer near you.